I thought I would post this in the RV10 list since it applies to the IO540 D4A5 typically installed in the RV10, although feel free to move it. About a week ago I noticed a slight miss/stumble during climb out. This occurred twice, but not on every climb out. It would only occur for a split second during the climb out, but did not occur during the cruise portion of the flight. Along with this symptom, during normal cruise I noticed a slight vibration that felt similar to a prop just slightly out of balance. You could see it in the glare shield. I downloaded the EFIS data from both occurrences and examined it looking for signs of something amiss. I knew the exact time of the anomaly, but it did not show in the data either because the sample rate was to coarse (1Hz) or it was not enough of an event to show up in the EGT, CHT, FF, FP etc. After reading another post of a catastrophic valve sticking in an RV10, and then thinking back to another aircraft I owned with a Lycoming 360 having experienced a severe valve sticking. The more I thought about it the more I became was convinced that this too was sticking valve. Lycoming has a service bulletin addressing the inspection of the exhaust valve guides at 400 hour intervals, SB333C. I decided to perform the Lycoming Service Instruction No. 1425A which provides a suggested procedure to perform the action. 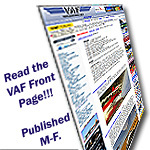 Mike Bullock has a great write up with photos in this post http://www.vansairforce.com/communit...d.php?t=128673 . I had all the tools including the ream from the last time I performed this task over 10 years ago on the 360. I was correct in my assessment. Cylinders 3, 4, 5, and 6 all showed evidence of a very slight "interference" fit" and would not pass the Lycoming wobble test. The .4995" ream required a little coaxing to get started in the guides, cylinder 5 was the tightest. I completed the operation on all six exhaust guides in about 9 hours and flew it the next day. With the 360, I religiously add TCP, a lead scavenger, to the fuel every time I fuel up. I put an additional 1400 more hours on the 360 without any issues, then replaced the engine at 2100 hrs with a Lycoming OH and have flown another 1200 hours without issue on the new engine. I'm going to start using the TCP with the 540. After 2 hours over 4 flights I feel confident the issue was indeed the beginnings of the sticking valve syndrome. I will be flying a long trip on Monday and hope to report a continued clean bill of health. One thing to add to this is that during the break in period I had a high amount of oil consumption. This continued through around 50 hours before it stabilized at a Qt. every 15 hours. Last edited by Bill.Peyton : 08-22-2015 at 03:59 PM. Great write up more people need to do the wobble test at 400 hours, I have seen alot of planes have this issue over the years and to have 2 write ups in one week on VAF it tells me there are more to be found if people would look. It will extend the life of the motor, and a good possibility to preventing a off field landing or worse a fatal accident. Preventive maintenance is so extremely important. Matter of fact I will do a talk at my next EAA Chapter meeting about this, for our plane owners. Last edited by jc11378 : 08-22-2015 at 01:12 PM. My O-360 has never stumbled again since using recomendid amount of Marvel Mystery oil in the gas . Loves Ldg. Airpark, Central FL. Bill, were you removing metal or lead deposits with the reamer? That sounds right Bill. You coked it on break-in, I'd bet. If your spark plugs have good color now you probably will be good for a long time. I remember Alan Barrett telling me about something that they do in all their engine projects that results in them having far fewer incidences of this problem than stock setups. As I recall, it can only be done on experimental, but I could be mistaken. I just don't remember the details of what it was that they do. Anybody know the details? Check and see if you if your cylinders are marked with the number 3 with a circle around it. You can find this mark on the top of each cylinder on the bottom left hand corner next to the valve cover near the drain tube. If a circle with the number 3 is stamped in this location then the SB referred to above does not apply. Now if you do have this symbol and still have a valve sticking problem then obviously something else is going on. I now have 685 hours on my engine and it continues to run great. I run mine exactly the same way you do yours with mostly long cross country flights and always LOP. The only difference is that I use Aeroshell W100 Plus with no other additives. Do you know what the significance of the "3" is? Yes apparently the valve guide is of an improved material and the clearance was increased.